Most popular trip: Spots are limited. Sells fast! On this trip you will get to experience the city Tblisi and the so popular lush green mountain Kazbegi. A chance to experience the best of both worlds: culture and green mountains. 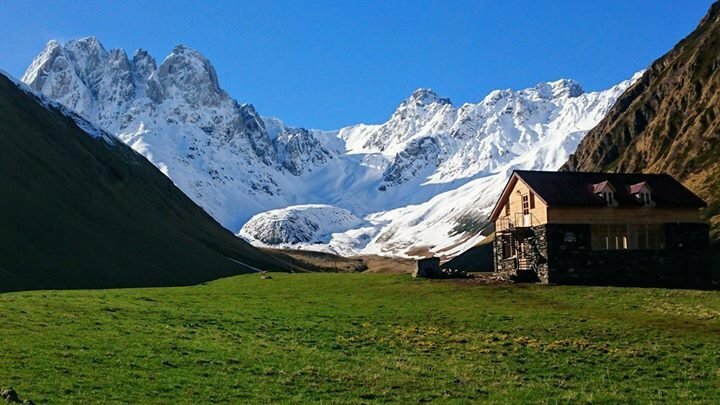 If you wish to experience real summer in Georgia – high peaks of Caucasus all covered by green and waterfalls, then we invite you to Kazbegi. To top it off you will get to visit ice cold GLACIERS! *NOTE: Its better to book your flight early as prices go up the closer we get to Eid date. • Check in on AirArabia flight at 3:50am from Sharjah to Tblisi. Upon arrival at Tblisi at 9:10am, company driver will be awaiting to provide you with transport to City Hotel. a company driver will be awaiting to provide you with transport to a 4* hotel. The 4* Hotel is set in central Tbilisi, short distance walk from Freedom Square, boutique-style the hotel offers free Wi-Fi. The modern, air-conditioned rooms feature stylish wallpaper and a flat-screen TV. • Once checked in at hotel and get ready for city tour to see the most popular attractions like the Cable Cart, Lady of Georgia, Cathedral etc. (Full City Tour itinerary to be shared separately). • Local folk dinner provided. ❍ Day 2: Depart to Kazbegi Mountain. • 7:00am early wake up call and breakfast at the hotel before we start our departure at 8:00am to Kazbegi to begin our outdoor adventure. Along the way we will stop for some sight seeing in Annuli fortress and Jcnvali water reservoir. Our first hike will be to Gveleti to see the refreshing waterfall. After a full day outdoors we finally check in at the guest house and prepare for dinner. * Feel free to break for lunch at any of the designated cafes located within the tour area at your own expense. This day is all about hiking in nature. We start our day with early breakfast at the guesthouse then trek to mount Gergeti and visit the Trinity Church. To top it off we will continue our trek towards Sadzele to enjoy the breath taking views of the ice cold GLACIERS! After a full day of adventure we return back to our guest house for a delicious hot meal and good rest. * Lunch will be provided in nature during our trek. • 7:00am early wake up call and breakfast at the guesthouse then transfer to village of Juta. There we will trek to Chaukhi pass. Having lunch at The Fifth Season Hut will make you appreciate the beauty of Georgia before heading back to the airport for check in at 14:10 and departure at 17:10 from Tblisi arriving in Sharjah at 20:20. * Lunch at The Fifth Season Hut is at your own expense. Note: Park Pass are included along with transfers between airport, Tblisi, and Gudauri. Those indicated at your own expense are not inclluded in your package. VIsa on arrival for all nationalitities with valid UAE Residency visa. Pick up & drop off to airport and private transportation through out the tour duration.